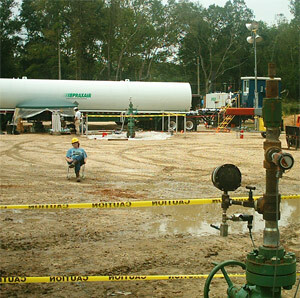 Researchers at the Gulf Coast Carbon Center, part of The University of Texas at Austin's Bureau of Economic Geology, are evaluating the practice of CO2 enhanced oil recovery (EOR) to assess its efficacy in storing carbon dioxide (CO2) underground over long time periods and to develop monitoring strategies required to validate these assessments. Two research projects at the Center are under way. 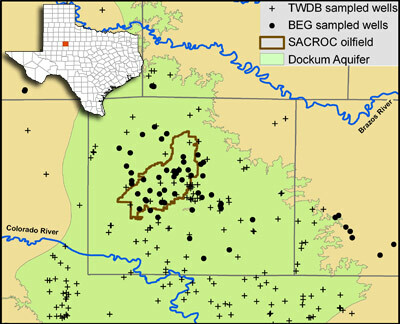 The SACROC study is looking at groundwater quality in an area where large volumes of CO2 have been injected since 1972. The Cranfield study is quantifying the performance of tens of old wells in retaining CO2 injected at high volumes. Initial results from both projects suggest that EOR can be a safe and effective way to store carbon in the deep subsurface. What are EOR and CCS? EOR is enhanced oil recovery, in which petroleum producers pump compressed carbon dioxide (CO2) underground to extract more oil from fields where oil production is declining. This CO2 is trapped underground and isolated from the atmosphere. Because these oil fields have accumulated hydrocarbons over geologic time, it is likely that emplaced CO2 will be stored for millennia. Meanwhile, concern over ever-increasing emissions of CO2 into the atmosphere has led to the proposal that power plants be modified to capture the CO2 that they generate while burning fossil fuels and pump it back into the ground—a process known as carbon capture and storage (CCS). Critics say that CCS is an unknown process and could be an expensive failure, especially on a scale large enough to mitigate impacts on climate significantly. Yet in a sense, half of a CCS system—the storage half—already exists in the form of EOR. Oil and gas operators already have the expertise and technology to inject CO2 deep underground, and they know some of the best places to do it. EOR and CCS, combined, present the possibility of new business opportunities. Capture of former “waste” CO2 to prevent it from going up power plant stacks will create a valuable resource that can be used for EOR where supplies of CO2 are now inadequate. Use of CO2 for EOR will provide a commodity value that can be used to reduce the cost of capture and the financial burden on power consumers. The second Carbon Sequestration Atlas of the United States and Canada, released by the Department of Energy in November 2008, concludes that the U.S. and Canada have the potential to store several decades' worth of the two country's CO2 emissions geologically in oil and gas reservoirs. According to the report, deep brine reservoirs have many times more capacity than oil and gas reservoirs, but without some of the financial benefits of EOR. Some data for the U.S.'s largest storage target were provided by the Gulf of Mexico Basin Synthesis, led by William Galloway, former senior research scientist at the Bureau of Economic Geology and currently a research professor at the University's Institute for Geophysics, also part of the Jackson School. Commercial CCS combined with EOR is already up and running, including a power plant in North Dakota, which removes CO2 from coal (in a process called coal gasification) and pipes it 204 miles to the Weyburn oil field in Saskatchewan, Canada, where it is injected into the reservoir to extend the productive life of the field by as much as 2 or 3 decades. EnCana, the Canadian oil company conducting the demonstration, projects that 20 million metric tons of CO2 will ultimately be stored at Weyburn and an additional 130 million barrels of oil will be produced. "It has a big significance for Texas because we have a lot of experience and need for EOR," says Sue Hovorka, research scientist and co-founder of the center. "The question we're trying to answer is whether or not this is the quality of storage you'd need to benefit the atmosphere. These studies decrease our anxiety and give increased confidence in our tools to see that the sites are performing well." The Dockum aquifer in the Texas Panhandle is one of the state's 21 minor aquifers, according to the Texas Water Development Board—meaning it supplies large quantities of water in small areas or small quantities of water in large areas. In rural Scurry County, Dockum groundwater is used for livestock, crops, and domestic purposes. About 225 miles due west of Dallas-Fort Worth and far beneath the Dockum aquifer—separated by about 5,500 feet of low-permeability rock—can be found one of the world's longest running CO2 injection projects. Operators began CO2 injection in the SACROC oil field in 1972. The field's name derives from the Scurry Area Canyon Reef Operators Committee, which was formed by several operators working under separate leases in the area when the field was unitized (consolidated under one managing entity, which is now Kinder Morgan Production Company, LLP). If the injected CO2 were to leak upward several thousand feet, it would dissolve in Dockum groundwater to form a weak acid. Buffering of this weak acid by aquifer rock could damage water quality. Geologists argue that CO2 EOR injections typically occur far below the level of groundwater that humans use. Here the CO2 is effectively immobilized in three ways: first, by chemical reactions that make it less buoyant than water; second, by capillary forces that make it “stick” inside pores; and third, by geological formations that form natural barriers against migration. They're such effective barriers that they have trapped oil and gas for millions of years. Scientists, policy makers, members of industry, and environmentalists all have a common interest in understanding the possible risks to freshwater resources. Over the past 37 years, operators have injected millions of tons of CO2 in SACROC field, mostly from naturally occurring underground deposits in Colorado and New Mexico. It's a mature field with thousands of production and injection wells, making it a textbook example for many other potential sites that could combine carbon capture and storage (CCS) and EOR. 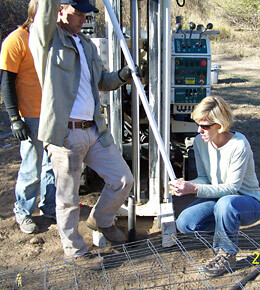 “If there are going to be impacts to overlying groundwater, SACROC's the best place to look,” says Rebecca Smyth, hydrogeologist and principle investigator and site manager of the research at SACROC funded by the Department of Energy's National Energy Technology Laboratory, through its Southwest Regional Partnership on Carbon Sequestration. Collaborators include partnership co-leaders University of Utah and New Mexico Tech; site host Kinder Morgan; and research participants from Los Alamos National Laboratories, University of Pittsburgh and DOE NETL, and University of Utah; and New Mexico Tech. Starting in the summer of 2006, Smyth collected groundwater samples from 62 wells over a 1,500-square-mile area, both inside and outside the 90 square miles of SACROC. Because CO2 dissolves in water at depth and comes out of solution at the surface, it is difficult to measure it directly in samples taken from water wells. She is therefore looking for byproducts of the interaction of CO2 with aquifer rocks or mixing with CO2-impacted brine from deep injection zones. Final results will be announced in September 2009, but the big picture is already coming into focus. “At this point, we do not see widespread, significant impacts from CO2 injection to water quality in the freshwater zones overlying SACROC versus those in the areas outlying SACROC,” says Smyth. The Bureau is helping conduct seismic surveys at SACROC to detect CO2 in the injection zone and track where it's moving. It is also constructing a geologic model to characterize strata between the deep CO2-injection zone and shallow groundwater. “If carbon sequestration were to become commercial, we'd need more practitioners in the U.S.,” says Sue Hovorka, lead scientist at GCCC. She says energy companies, oil-field service companies, and electric utilities are increasingly looking for skilled carbon management professionals, but there are few places for workers to get training. In the past year, GCCC has grown tremendously with the hiring of two research associates, three postdoctoral researchers, three visiting scholars, and eight graduate students. Reflecting the multidisciplinary nature of this new field, the researchers approach carbon sequestration from many different directions, including monitoring, modeling, environmental risks, economics, public policy, and regulation. The new researchers hail from many parts of the world, including China, Korea, Iran, Ghana, India, and Venezuela, as well as different areas of the U.S.
Jiemin Lu is a postdoctoral researcher from China, who joined GCCC this past year. He received a Ph.D. at the University of Edinburgh for his study of a North Sea oil field having a high concentration of CO2 that served as a natural analog to engineered carbon storage projects. He says that the prospect of working on real carbon storage projects attracted him to Texas to work at GCCC. Its high-profile research projects and ability to attract top young talent from around the world attests to the strength of GCCC's research. Still, most of the education at GCCC occurs as on-the-job training. Hovorka and Lu both say that if the Jackson School of Geosciences, which subsumes the Bureau and GCCC, offered a Master's program or even formal courses in carbon sequestration, GCCC would be better positioned as a leader in this potentially big new field. Like SACROC, Cranfield is a venerable oil and gas field. Situated 10 miles east of Natchez, Mississippi, its heyday was in the 1940s and 50s. When production fell off in the 1960s, it was depressurized by production, and most wells were plugged and abandoned. Now Denbury Resources, out of Plano, Texas, is using EOR to breathe life back into the field. Denbury produces CO2 from Jackson Dome and pipes it 120 miles to Cranfield field. Because the pipeline infrastructure needed for large-volume injection is in place, the field has been unitized by Denbury, and excellent reservoir characterization data are available. Cranfield presented a unique opportunity for scientists to assess issues related to EOR and to large-volume injection. Researchers from the Gulf Coast Carbon Center are participating in the Southeast Carbon Sequestration Partnership (SECARB), a regional partnership funded by the U.S. Department of Energy's National Energy Technology Laboratory and managed by the Southern States Energy Board. The scientists are monitoring ongoing injection of CO2 to determine whether pressure is contained adequately in an area that is penetrated by many old wells. In addition, the team is developing a site for making the rigorous measurements needed to estimate how big a site would need to be to host injection of a typical power plant's output. Lastly, the project is developing monitoring strategies that can give operators and regulators confidence that any particular injection site is sequestering fluids properly. The expertise of 15 organizations is tapped to conduct this experiment: site characterization, modeling, hydrology, and geochemistry (Bureau of Economic Geology); site host and CO2 expert (Denbury Resources); smart well engineering (Sandia Technologies); cutting-edge monitoring tools (Lawrence Berkeley National Laboratory); crosswell electrical imaging (Lawrence Livermore National Laboratory); geochemical analysis (U.S. Geological Survey, Mississippi State University, Oak Ridge National Laboratory); wireline logging (Schlumberger Carbon Services); modeling (QEA and Advanced Resources International); hydrology and near-surface sampling (University of Mississippi and U.S. Environmental Protection Agency); and geomechanical response (Pinnacle Technologies). To answer the first question—about fluid containment in an area with many old wells—the research team designed a dedicated observation well. 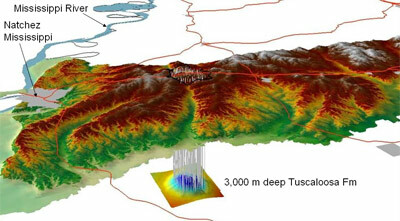 The well is perforated at 10,300 feet (in the lower Tuscaloosa injection zone and future production zone), as well as in the monitoring sandstone 400 feet higher. Temperature and pressure meters were placed at these perforations, isolated from one another by an impermeable packing material, and connected via cable to a satellite uplink. Pressure and temperature in both zones are recorded every minute and transmitted to an Internet system every 10 minutes, allowing team members to track the progress in near real time. Last July, Denbury began CO2 injection into the lower Tuscaloosa Formation in nearby wells. Pressure in the lower Tuscaloosa Formation responds quickly to changes in injection. According to models of the subsurface, it might be several more months before the CO2 plume reaches the observation well. Over the past 6 months, pressure has increased more than 1,000 psi in the injection zone, but there has been no corresponding change in pressure in the monitoring sandstone 400 feet above, suggesting no “pressure communication” between the two zones. Researchers are waiting for indicators that CO2 has reached the observation well, an event known as breakthrough. Models suggest that it may take several more months. However, early indications are that the CO2 remains contained and injection pressure remains stable, even in an area with many old wells. As this observation continues, the next larger phase injection is under way. Four new wells, located outside and deeper than the oil-producing area, will be used for CO2 injection. The injection rate will be increased to a million metric tons per year to simulate the output of a typical coal-fired power plant more closely. Two dedicated observation wells have been designed with a novel suite of instruments, which, combined with an array of far-field measurements, will allow the team to gain a more quantitative picture of high-volume injection. Of particular interest is linking the magnitude of pressure change in front of the CO2 plume to the geometry of the plume and the rate of injection. The team will measure how CO2 distribution in the rock changes with time and how rapidly fluids move within the plume. A series of measurements will be used to determine how the rock is stressed and deformed in response to changes in pressure. Rock stress will help researchers determine safe injection pressures that will not create ruptures or otherwise cause geologic seals to leak. Many advocates of the practice see CCS not so much as a magic bullet, but more as a bridge to our energy future—a way to make current energy sources cleaner while scientists and engineers are developing something better. “Carbon capture and storage allows current and near-term energy needs to be met using traditional sources until alternative sources are economic at the scales needed for long-term demand,” says Meckel. “I think the major point to be made is that if a geological sequestration site is properly characterized and chosen, there should be very little chance of impact at the surface,” says Hovorka. 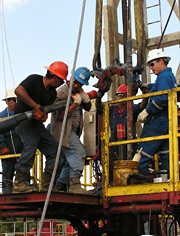 “The technology exists through all the tools developed by the oil and gas industry to characterize the subsurface. So it's not a hard thing to do.